In my previous article in this series, I discussed some simple ways to make working with local WordPress development environments a bit easier by using shell scripts to automate the more repetitive tasks, such as installing and deleting WordPress sites. In this article, we’ll look at automating things a bit further and converting the scripts to WP-CLI commands. We’ll also look at how we can use the WP-CLI Package Index to make things easier and share our workflows with other developers. Let’s get started by creating our very own WP-CLI command. We’ll be able to use this command to quickly install or delete WordPress sites instead of using the old Shell scripts. * Quickly manage WordPress installations. * : The destination for the new WordPress install. * Uninstall the given WordPress install. * : The site that should be uninstalled. The code above does a few things. First, it checks if WP-CLI is available and adds the installer CLI command if it is. 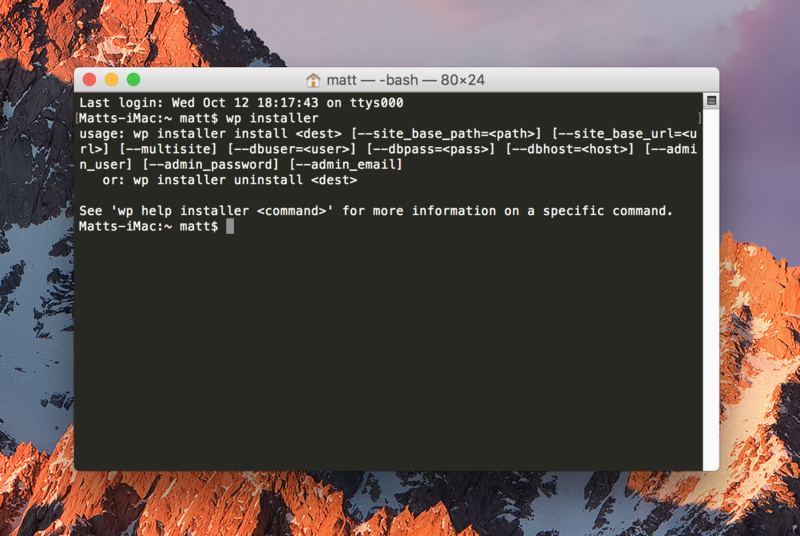 The installer command has two subcommands for now, install and uninstall. The WP_CLI::launch() command is used here to launch several existing WP-CLI commands that are responsible for downloading WordPress, creating the wp-config.php file, and creating/installing the database. We use WP_CLI::launch() here instead of WP_CLI::run_command() because launching the commands as new processes allows us to specify an external path to run the commands. In this case, that path will be the base path that all future sites will be installed under. One popular option is to have a ~/Sites folder that will contain all of the sites that you’ll be working on. By default, the base path will be set to the current working directory in the terminal, but this can be easily overridden by providing the --base_path argument to the command. To prevent accidental data loss, the WP_CLI::confirm() function is used here to prompt the user to make sure they want to proceed. To support integration with other scripts, this confirmation can be skipped by passing --yes as an arguement to the subcommand. After that, the database is dropped using the wp db drop command, and the files are deleted. You may have noticed that while running the above subcommands, I didn’t pass in any of the arguments such as the base path or database connection information. While it’s definitely possible to pass these arguments to the command manually every time, another possibility is to store commonly used information in the WP-CLI config file. The WP-CLI config file is usually located at ~/.wp-cli/config.yml, but this can vary from system to system. To be sure, you can run wp cli info and double check the location of the WP-CLI global config. Now when you run wp installer install <site name>, any of the default values stored in the WP-CLI config file will be automatically applied as associative arguments, and WordPress should be installed in the desired location. If you haven’t already, you should definitely take a few minutes to check out the WP-CLI Package Index, a growing collection of 3rd party WP-CLI commands that can be installed in seconds. 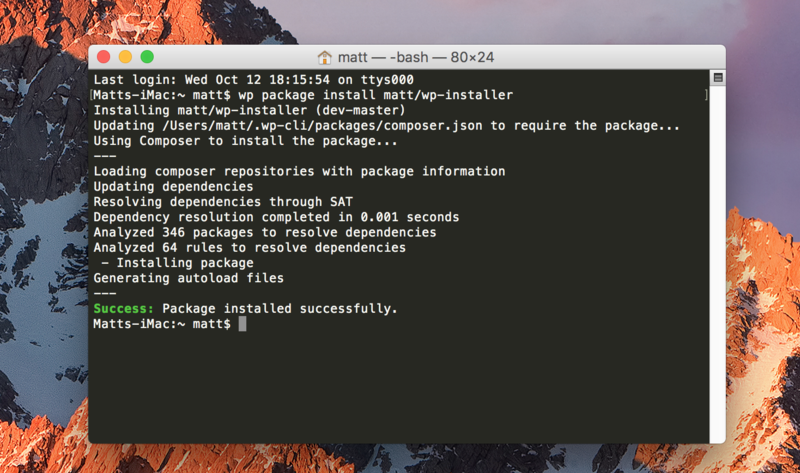 Any package can be installed by simply running wp package install from your terminal. 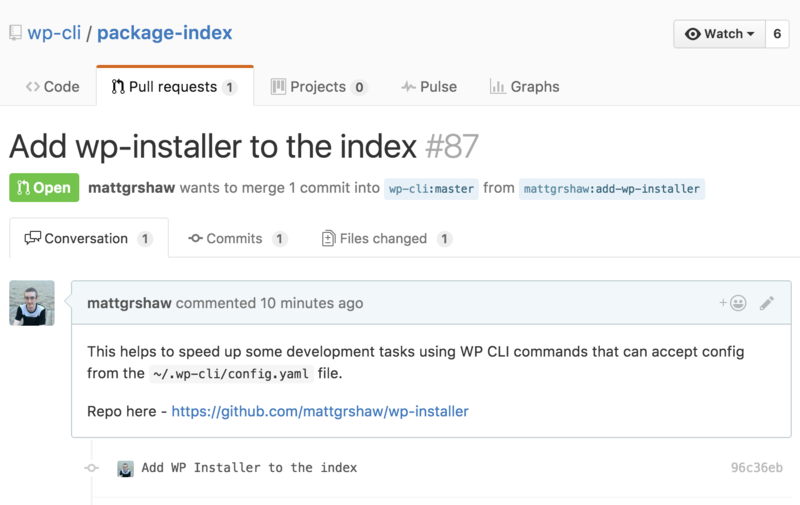 Luckily, it’s just as easy to submit our own commands to the index, so anyone else can download and use the wp installer command without installing it as a plugin and running the command from an active WordPress installation. Now that it has been installed as a package, the wp installer command can be run from any location in the terminal to quickly spin up or delete a site. While the WP installer command is still somewhat limited in functionality, it’s incredibly easy to extend it further by adding more WP-CLI subcommands. Another logical step would be to add functional tests and some better error handling to make the code more future proof, and I’m sure I’ll be refactoring as I use the commands more. Have you started converting your old shell scripts to WP-CLI commands? Do you have any suggestions to improve these commands? Let me know in the comments. This entry was tagged Deployment Scripts, Automation, WordPress Development Tips, Database, WP-CLI.